The mystical fores of Arrayanes in Argentina. 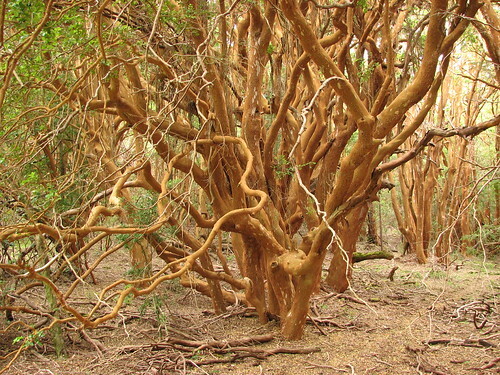 These rare trees (Luma apiculata) only grow in the Quetrihué Peninsula. This particular stand is of a small group that are more than 300 years old with a few individuals that may be as old as 600 years. if you go a bit further south there is a tree that is 2600 years old dont remember the details off top of my head but it grows 1mm per year from a seed.i tolk photos if you would like to see.jackklives@hotmail.co.uk. or can view on face book. The arrayan tree is not unique to de The Arrayanes Forest. It grows all over the southern Andes, in Chile and Argentina. The uniqueness of this place is due to the fact thay they grow here to form a pure forest with huge individuals. The other very old tree further south you jackklives talks about is de Alerce (Fitzroya cupresoides), the second oldest living tree in the world after the bristlecone pine tree in north america, reaching ages close to 4000 yrs.